Sun City Summerlin is a 55+ Del Webb community offering exceptional amenities and a fabulous location. Set in Las Vegas, Nevada, Sun City Summerlin is a Del Webb development designed for active adults aged 55 or better. This well-established community is nestled in the Spring Mountain Range, at an elevation of 3,000 feet. Sun City Summerlin features 7,779 homes, making it the largest age-restricted community in Nevada. Sun City Summerlin was built by Del Webb between 1989 and 1999. It features four clubhouses, three golf courses, three restaurants and homes that appeal to many different active adult homebuyers. Its 2,400 acres of rolling grounds offer fabulous views of the Las Vegas Strip and the surrounding mountains, while its elevated location offers cooler temperatures than the valley below. This Del Webb community is part of the larger master-planned Summerlin community. Summerlin is spread across 22,500 acres and includes nearly 20 residential villages, 150 miles of walking trails and 100 neighborhood parks. Summerlin also offers fabulous restaurants, retail centers, resorts, spas and casinos. 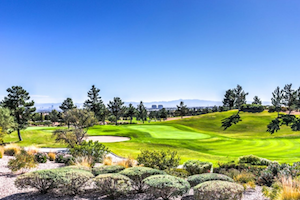 The 18-hole Highland Falls Golf Course is one of three impressive golf courses at Sun City Summerlin. Amenities within Sun City Summerlin are located at four different clubhouses. At the Mountain Shadows Clubhouse, residents can enjoy an exercise room and indoor spa, table tennis and the Five Star Tavern. It also offers an outdoor lap pool, six tennis courts, four shuffleboard courts, a racquetball court, horseshoe pits, a mini-golf course and the 18-hole Palm Valley Golf Course. 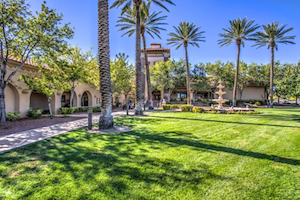 The 44,000 square-foot Desert Vista Clubhouse features a wide range of social and recreational amenities. Residents can express their creativity in the arts and crafts studio, sewing room and ceramics studio. The clubhouse also includes billiards, multi-purpose rooms and a fitness center with a separate aerobics room. Its outdoor amenities include a swimming pool and spa area, horseshoe pits and sports courts for tennis, pickleball, bocce ball and basketball. The amenities continue at the Sun Shadows Clubhouse, where residents can make use of hobby and game rooms, an aerobics and dance studio, an Olympic indoor pool and spa, a computer lab and four bocce ball courts. The Pinnacle Clubhouse also provides hobby and game rooms, a 312-seat theater, the Summit Restaurant and the 18-hole Eagle Crest Golf Course. There is also an 18-hole golf course and practice facilities at the Highland Falls Golf Course. Sun City Summerlin's 7,779 homes include both attached and single-family designs in sizes and styles to meet the needs of many different homebuyers. Attached homes range in size from 1,003 to 1,757 square feet. They include one or two bedrooms, one to two-and-a-half bathrooms, and one-and-a-half to two-and-a-half-car garages. Active adults in the Las Vegas area can enjoy Sun City Summerlin for its beautiful mountain setting, fabulous homes and resort-style amenities.